Bay Side is a luxury beach front apartment, rated 5* by Visit Britain. 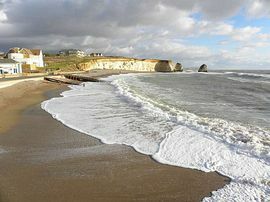 The apartment enjoys stunning panoramic sea views overlooking Freshwater Bay and The English Channel. It has direct access to the beach in the Bay. Located in a quiet and peaceful position, but within walking distance of 2 golf courses, local restaurants and tea room, shops, bus stop (take a Round the Island open top bus from just outside), and of course right on the beach for sunbathing, swimming and water sports. The village of Freshwater nearby has 2 supermarkets to stock up with groceries for self-catering, takeaways, shops, and a Leisure Centre with swimming pool, gym and tennis courts. The apartment is perfect for 2 couples sharing, or for families (sorry no children under 10) and is genuinely beach front, with a large terrace overlooking the beach, with steps and a private gate to the beach. A rare location, featured in all tourist board literature and on calendars and with no road between the apartment and sea front. Ground-floor & therefore suitable for "elderly/infirm". 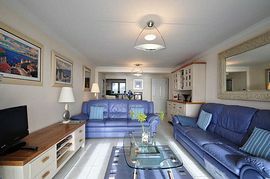 The spacious large bright south-facing lounge/dining room enjoys spectacular sea views. It is furnished with high quality furniture in a 'seaside' style, with comfortable leather sofas (one with recliner) seating 6 and and a dining table and 4 leather-upholstered chairs. You can sit anywhere in the room and enjoy the wonderful views of the Bay and listen to the sound of the waves rolling in. Mirrors, carefully chosen pictures and a blue-lit modern fireplace give the apartment a homely feel. TV, free view, video, DVD, CD, radio, I-pod docking station, Wi-Fi and modern lighting ensures you can read, watch TV, listen to music or just chill-out in comfort. A selection of books, magazines, games, DVDs, and CDs are provided. The kitchen is modern and well-equipped and has an electric oven, gas hob, dishwasher, washer/dryer, fridge/freezer, microwave and all the kitchen utensils you need for self-catering. 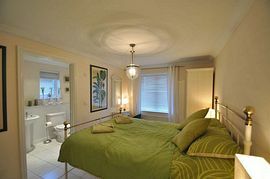 Bedroom 1 has a 5ft bed, 2 built-in wardrobes, a free-standing wardrobe, chest of drawers, dressing table, chair, 2 bedside tables, lamps, rugs and pictures - all in a stylish tropical theme. The room is light and bright. The en-suite shower room has modern shower cubicle, WC, hand basin and plenty of storage. Bedroom 2 is light and bright and has a double bed, wardrobe, drawers, and is decorated in a cheerful seaside theme which will make you smile! The adjacent bathroom has a corner bath with mixer taps, WC, hand basin, plenty of storage and is modern, clean and inviting. Although not adapted for disabled this apartment is ground-floor and suitable for elderly/infirm. Please email owner for details. Large terrace/undercovered patio overlooking the beach and sea with stunning views. Direct access to the beach. Communal lawns/garden. Table and chairs/loungers. Outside lighting. Allocated parking on site. The Island can be reached by ferry from Portsmouth, Southampton and Lymington. 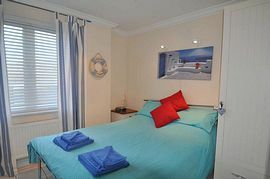 Nearest ferry to the apartment is Lymington/Yarmouth (7 minute drive to apartment). However, we are easily accessible from all ferry terminals on the Island. When booking please ask for ferry operators' booking numbers to be sent if required. Ferry tickets can be booked on-line or by telephone in advance. Full directions to the apartment will be sent on booking. 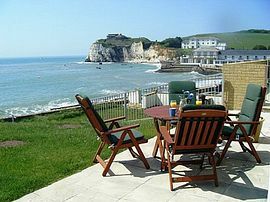 Please enquire re cost and availability of short breaks Oct - March. Our tariff includes, electric, gas, water, linens, towels, complimentary toiletries & Wifi. Short breaks available Oct - March from £300 - please enquire. Please note: The apartment gets booked very early for the peak Summer months - if you are wanting to book again for 2015 please do so asap to avoid disappointment. "This apartment is our own little bit of paradise - who needs to go abroad when we can have this in England." Ms R, London. "Where else can you sit and look out to sea whilst eating your lunch. We have visited the Island for the last 7 years and this is the only apartment where the family are all agreed we want to come to again next year." Mrs B, Bournemouth.